…and kind wishes and wonderful words and positive thoughts have all helped. The past few days have been busy with my appointments. I have one today and then two on Friday and then I am pretty much done until the hip surgery whenever that will be. My mind will be freer by the end of this week and I will be totally flexible. Mom is stabilized, whatever that really means. She is being monitored closely and they are going to start trying to decrease her oxygen intake. She is on a full face mask from the top of hairline to under her chin. They even brought in another bed with a better mattress for her. I don’t really know why but they say it is better for her. Hopefully it is to help prevent beds sores as this is her 14th day of laying in bed without getting up. Sadly Dad woke up yesterday morning with some very serious health issues. He pushed his way ( good for him ) into his Dr’s office yesterday and had tests done at 7PM last night. Now we wait on that. The rain has been relentless and despite an 80% completed repair on the roof we still have a few leaks….in the area of the completed repair. The company will be back tomorrow. There is always something that needs doing. I really need my stair railings. It has been three weeks since that company came out to measure. It seems that the hold up had something to do with a bunch of engineers in Vancouver that need to approve everyone’s stair railings. Some law that is in place that certain rules and regulations have to be met in order for safety. Well I am not safe without railings in place. Since when did this become a major issue? I got my eye glasses back yesterday. Do you remember back in December when they got broken? I finally gave up getting them repaired in Mexico and purchased a new pair in January. It has take almost three weeks to get my glasses repaired here in Canada. First the part was ordered and sent here to Kelowna but the optical company could not make the repair so they sent the part and my glasses back to Vancouver. Turns out that Vancouver could not do the repair either so they were sent to Montreal. Fianlly I have them back and I realized that the ones I had made in Mazatlan were not quite right. Something about where my bifocal line sits. Much easier to use the computer now and to read. I had enough energy last night to make us a good meal using just left overs. It really helps to keep a full fridge of good ingredients. In addition to a good glass of vino blanco I added my special apron and was ready to cook! 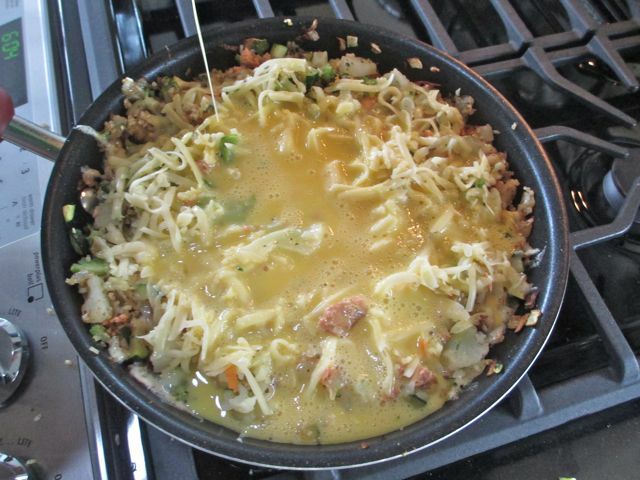 Start by frying an onion with fresh zucchini, add chopped up precooked/ left over cauliflower and broccoli, a 1/4 of a baked potatoe found in the fridge, a bit of cooked rice and 1/2 cup of Mexican cheese. Add seven pre whisked eggs and let to start to set. Place your fry pan in a 400F oven until the eggs are set. Be sure you have an ovenproof frypan. Voila my first ever frittata! 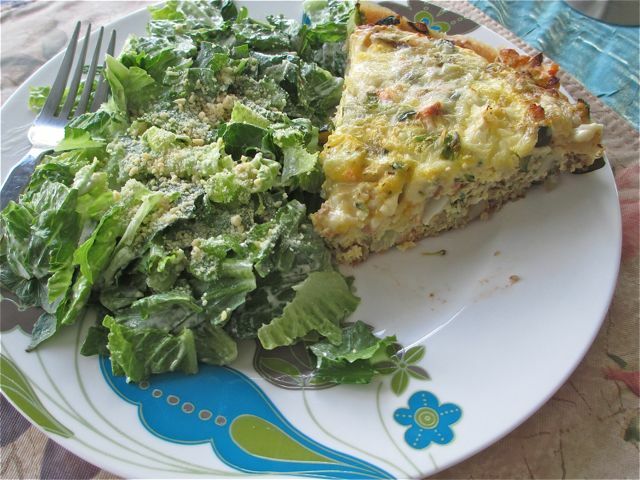 An easy and filling dinner with left overs for 2 more meals. ..got to go or I will be late. Adios for now and thanks for being there for me. Getting older is “not for sissies.” I’m a year older than you so I can identify! I hope your medical issues get resolved correctly and quickly. Cheryl….thank you. You are welcome anytime and I will even supply the vino! Peter…it was and I get leftovers. George….gracias. A good meal helps lift the mood. Connie…..you are so good to me. Hugs back. Elaine…you have a lot on your plate also. I will accept those hugs. So much to do and so little time, at least you had time to whip up a tasty meal. Good luck with them medical issues. 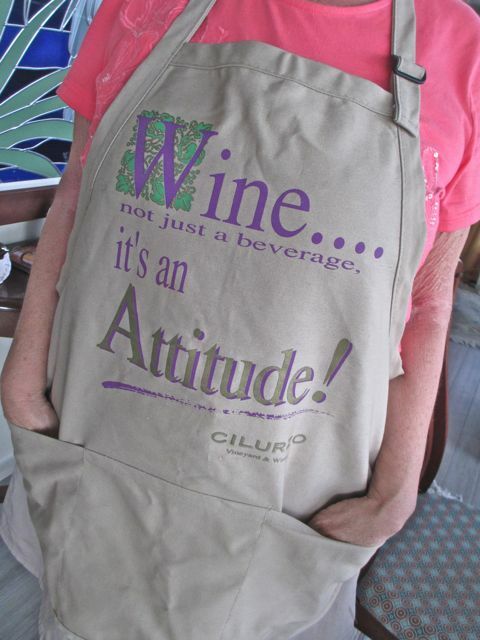 Love the apron – food looks fantastic – chin up, girl, you CAN do it!! !